The Lone Mountain Area subdivisions, located near Scottsdale and Dixileta Road, are a short drive South to shopping, dining, and the 101 Freeway. Drive North to AJ’s, Summit Shopping Center, Albertsons, and the unique towns of Cave Creek and Carefree. 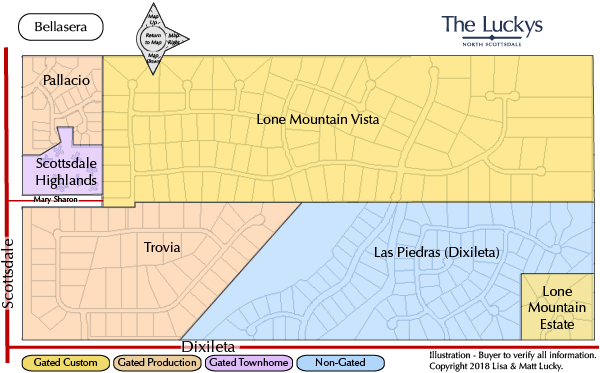 These subdivisions include Lone Mountain Vista, Lone Mountain Estate, Las Piedras (Dixileta), Trovia, Scottsdahe Highland Townhomes, and Pallacio. See all Lone Mountain Area - New. See all Lone Mountain Area Sold.